A pro knows his gear, inside and out. A pro has invested thousands of hours to master his craft. A pro understands proper exposure and creative exposure. A pro knows the rules of composition. A pro has invested thousands of dollars in the best tools to do the best work. A pro knows how to use the industry’s best software tools. A pro uses web hosting and safe backup and storage systems. A pro knows retouching and color correction. A pro knows how to use and shape light, both natural and artificial. A pro knows how to pose subjects to get the most natural look. 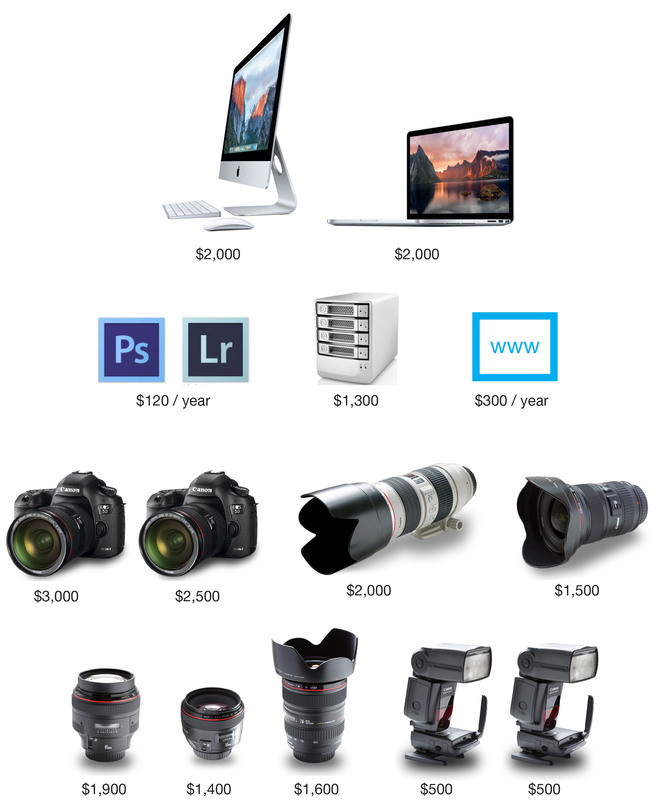 Pictured above are the base tools and their approximate costs that a pro photographer needs. Yes, a pro photographer needs two camera bodies, just in case one fails on the job, there’s a backup. There are much more accessories not pictured such as tripods, monopods, camera straps, camera bags, flash accessories, light stands, reflectors, telephoto lens extenders, lens filters, portable hard drives, ink-jet photo printers, paper, inks, and dozens of software additions that are needed. And, there’s additional costs for insurance, transportation expenses, assistants, stylists, props, backdrops, seminars and training expenses. What you get when you hire a professional photographer is all of the above. It’s a valuable investment in his/her time, energy and expense to get to the level of competency that is required to be competitive and excellent. Next time you think you can shoot it yourself, re-read this blog post!